Needlepoint kits give you all the tools you need to make a needlepoint item quickly and easily. They are an excellent starting point for the new needlepointer and an easy project for those with more experience. You can probably find a large selection of needlepoint kits in your local craft store. The kits are usually with the cross stitch kits, and you may have to look carefully to determine which is which. If you prefer online shopping, you have a great selection to choose from. The Internet is full of stores that carry needlepoint kits and supplies. 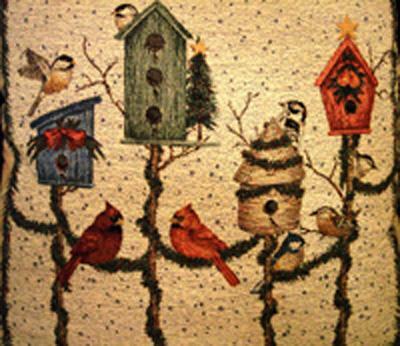 Beth Russell Needlepoint offers kits for pillows, rugs, cushions, stool tops, miniatures and more. Many are inspired by William Morris designs and feature natural motifs. Spin a Yarn has a wonderful collection of colorful pillows and even a needlepoint purse kit. Ehrman Tapestry features gorgeous, but pricey, needlepoint kits for pillows, cushions, rugs, wall hangings, miniatures, and "exotics." Jo-Ann's Fabric and Crafts is available in most locations, but if you don't have one in your area, they offer a wide selection of kits online. Herrschner's has been in the craft mail order business since well before the Internet began. They carry a nice selection of kits and other supplies. The Art Needlepoint has unique needlepoint kits for every decor and level of ability. Expect to find canvas on which to stitch the design. Canvas may be stamped or unstamped. The stamped type is better for the beginner because the fabric is stamped with an image for you to follow. Thread to complete the project should be in the box. Needlepoint can be stitched with regular embroidery thread or yarn, depending on the project. Complete instructions and a picture of the finished piece are included. If your needlepoint kit is unstamped, there will also be a chart for you to follow. A needle is usually included, but read the package carefully. Sometimes it is not. Finishing materials, such as a pillow form or backing are sometimes, but not always, included. If you're a beginner, you'll want to pick a kit that is not very complex. A small design using only a handful of colors may be best. Save yourself some frustration, and don't pick out a giant wall hanging using 30 different colors for your first project. Pick a kit with a design you like and one that makes something you will find useful, such as a pillow. Working with a kit is very easy. All you have to do is follow the instructions that come with the kit. They will tell you how many strands of thread to use at a time and how to make any special stitches that may be required. Be sure that you read the instructions carefully before you begin and make the stitches according to the instructions given. Don't plan to give your first needlepoint project as a gift, just in case it doesn't turn out. Beautiful needlepoint takes practice. Depending on how you are going to use your finished needlepoint, you may need to block the project when you are done stitching. Blocking refers to the process used to make the piece square. You'll need to get the piece wet, but not soaking. Gently rubbing it with a wet washcloth may be sufficient. Start at the top, and tack the piece down to a board or mat (you can also tape it to the floor). Stretch it gently so that you can make that side straight. You'll work all the way around the piece, stretching it square and securing it in place. When the piece dries, it will stay square. Then you can finish it however the instructions suggest. Kits are a fun way for a beginner to create a needlepoint project and allow the experienced needlepoint artist to finish a gift item quickly and easily. With the hundreds of kits available, there is sure to be one that is perfect for you.